Take off gently from the custom designed parasailing boat and soar 1,300ft enjoying the amazing scenic views over crystal clear waters and 144 beautiful islands that make up the Bay. Fly solo, in tandem or in triple flights and share the fun...or the fear! You're welcome to bring your camera but are likely to be far too occupied with soaking up the amazing views to take photos so let the team to it for you. Digital photo and video packages are available for purchase. 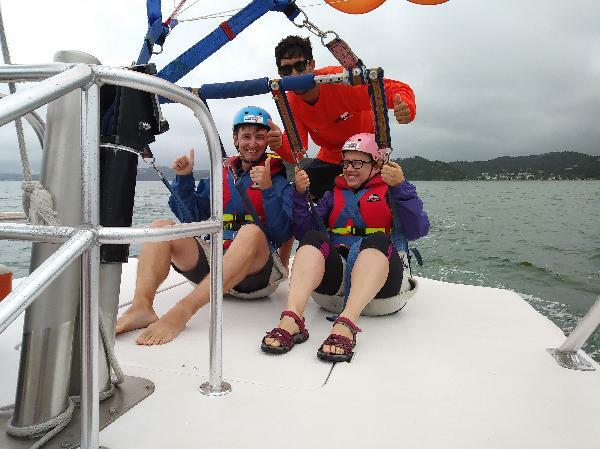 After experiencing the thrill off NZ's highest parasail, you'll be gently returned to the boat without even getting wet - unless you want to! 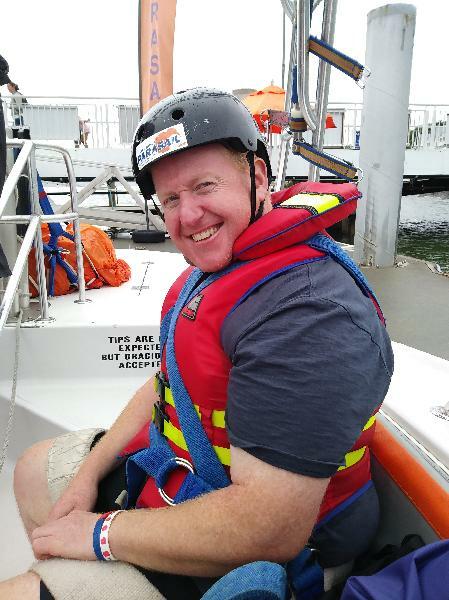 With a perfect safety record and over 20 years parasailing experience, you'll be in safe hands. To say this parasailing experience is exhilarating and breathtaking would be an understatement. Come and see for yourself why this is such an amazing flight experience receiving rave reviews. Duration: Approx 10 mins flying time. Allow 1hr 15mins for the whole trip. Product Extra's: Digital photo and video packages are available at $40 per flight. Our crew will take a short video of your take off and at least 40 photographs of you parasailing plus 20 aerial views of the Bay on a 4G SD memory card for you to keep. Can be purchased when you proceed to checkout. Full refund in the event of a cancellation. Bookings subject to weather conditions. There are weight restrictions on a Tandem flight based on a combined weight of both participants and wind conditions at the time of your flight. The weight range is between 60 and 220 kilos. The wind is very changeable in the Bay of Islands therefore we cannot guarantee weights until the time of flights. Date at 1300ft above water! It was exciting and a great experience, crew was friendly . The photo package was amazing . Nice way to see beauty of islands...duration of trip is 1-1:30 hrs and flight is about 10 minutes, I wish it could have been longer. Staff are friendly and experienced. Thumbs up!!!! Well worth it - awesome views. We booked this as a Christmas present for our girls while on holiday in NZ. They were a bit nervous but these guys were great, relaxed and friendly. We were able to go on the boat too at an additional $25pp - it was great fun much like a jet boat experience. You’re out on the water fit about an hour. Would recommend going to the ‘alongside’ bar afterwards. Thanks guys. 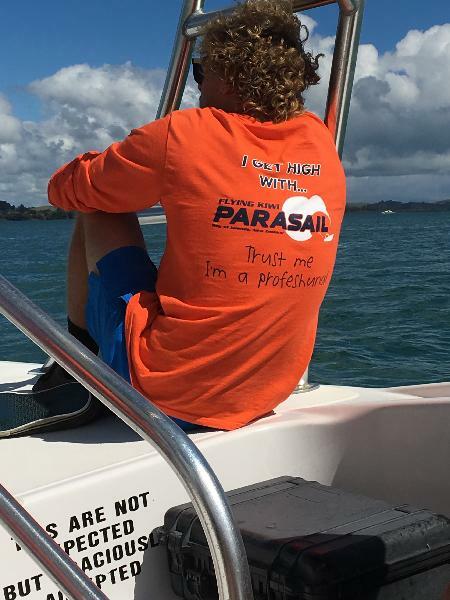 Your message has been sent to Flying Kiwi Parasail - 1,300ft Flight - Paihia. You should hear from them shortly. 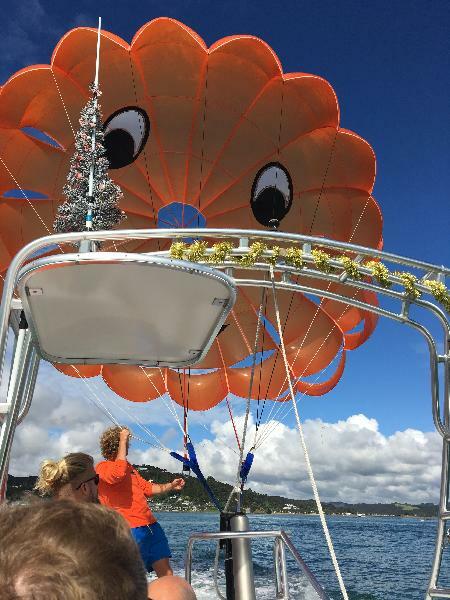 Please note: all responses will come directly from Flying Kiwi Parasail - 1,300ft Flight - Paihia, and not the team at Bookme.